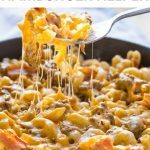 Gluten Free Bacon Cheeseburger Pasta Recipe - from scratch! It doesn’t get much better than gluten free Bacon Cheeseburger Pasta! This easy weeknight dinner cooks in less than 20 minutes. 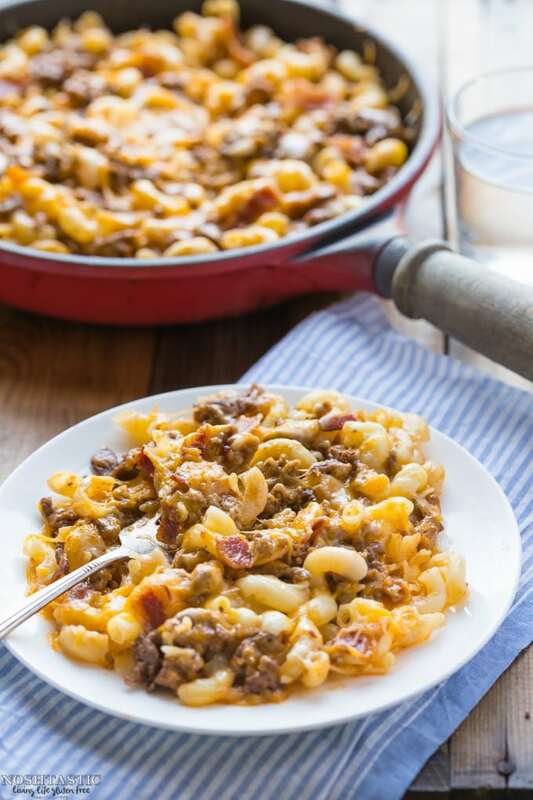 If you’re looking for a healthy homemade version of hamburger helper then you’ve come to the right place! I made this Bacon Cheeseburger Pasta with gluten free pasta and none of the canned soups you might normally find. My recipe is made with ground beef and lovely bacon pieces. The sauce part is totally made from scratch with a combination of Worcestershire Sauce, cornstarch, beef broth and other yummy flavors. I don’t know about you, but for me, life just seems to get busier and more hectic every day. 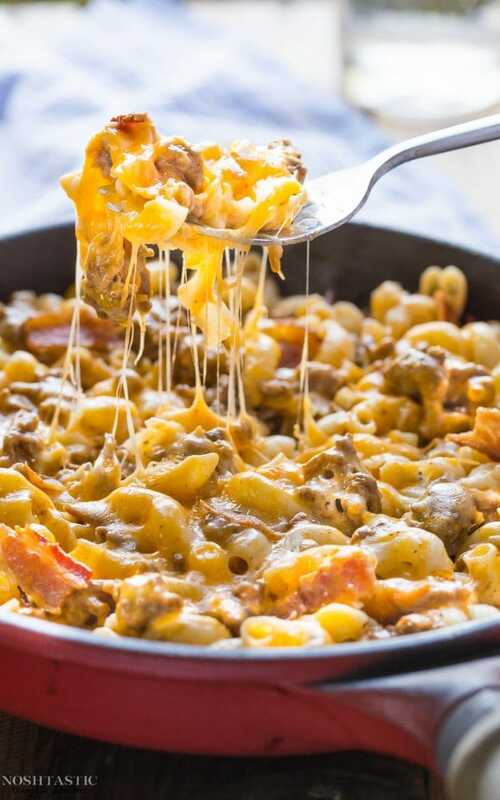 Often it means that cooking tasty, healthy meals that everyone in the house will love can sometimes be a bit of a challenge but I think that my Gluten Free Bacon Cheeseburger Pasta will make everyone happy. I was looking through an old Taste of Home recipe book recently when I came across a very similar recipe and knew instantly that it would be something that I could tweak to cook on a weeknight without too much stress. And most importantly I knew my family would enjoy it! I have two boys at home and as predicted they really loved this recipe and even asked me to make it again. My youngest son is eleven, he had two bowls for dinner and asked for a third, it was that good! He even insisted on having a bowl when he came home from school the next day instead of his usual snack. Did I mention how simple it is to make? You can throw this together and have it cooked and ready to serve in less than thirty minutes, and you probably have most of the ingredients in your pantry already. If you are gluten free, or have gluten free family or friends this would be a very easy dish to make for them. Simply substitute gluten free pasta for regular and make sure the beef broth and Worcestershire sauce is gluten free and you are good to go! If they are also dairy free like I am then you can use a shredded vegan cheese substitute, it works just as well. Oh, and if you’re looking for a nice vegetarian alternative then you’ll love this One Pot Taco Spaghetti from Vegetarian Mama. It doesn't get much better than gluten free Bacon Cheeseburger Pasta! This easy weeknight dinner cooks in less than 20 minutes. Please watch my short recipe video before you start! It’s right below the directions. Cook your gluten free macaroni according to directions on the pack, then drain. While the macaroni is cooking, brown the beef in a large skillet until fully cooked. If after cooking the beef has a lot of fat/liquid/juice left you can pour some of that off, I prefer to use lean beef and keep some of the juice as I think it adds to the flavor. Add cooked pasta to the skillet along with the beef broth mixture, stir well to combine ground beef, pasta, bacon, and sauce. Sprinkle shredded cheese over the top of the skillet cheeseburger mixture. Cover and cook on low heat until cheese has melted, about 2-3 minutes. Sheena, I’ve developed lots of recipes for my gluten-free friends. I have several, none who are celiac but rather sensitive. And the number of good quality gluten-free pastas out there seems to be increasing all the time. 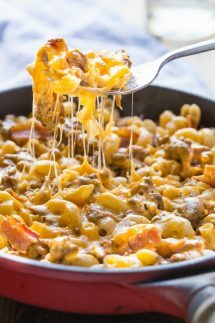 Your gorgeous bacon cheeseburger pasta looks like something my friends and I are going to love! Hi Jean, thank you for your kind comments! I found a pasta recently that was made from lentils and nothing else, it was really good but a little pricey. This looks SO delicious! Need to try it out ASAP! Thanks Rachel, it’s really super tasty! Hi Ann, it’s so good, you’ll love it! I made some this week, the kids think it’s the best thing ever! I’m sorry it tasted floury, I’ve never had that issue with using cornflour before. Usually when it’s dissolved in liquid it has no taste. you can reduce the amount of cornflour if you like. This is so good! My husband, 3yo boy and I love it!! Will make it again and again! Thank you! !